When your toddler becomes ill, she will often have thick green mucus. In the past, medical professionals used to believe that green mucus signified a bacterial infection, which could be treated with antibiotics. As of 2011, however, experts including Dr. William Sears report that this belief has been refuted by researchers. Your toddler's green mucus might be caused by a virus — including one of the viruses that causes the common cold. Green mucus can appear at the beginning or the end of an illness. Usually, however, a toddler will have clear mucus at the beginning of the illness, then develop yellow or green mucus as the condition progresses. Your toddler is at her most contagious state when her mucus is clear, according to the California Childcare Health Program. As she begins to get over the cold, her mucus may turn green or yellow as she excretes large numbers of white blood cells that died fighting the illness. A toddler may develop an illness that causes green mucus from a variety of sources. The most common source is a cold virus. 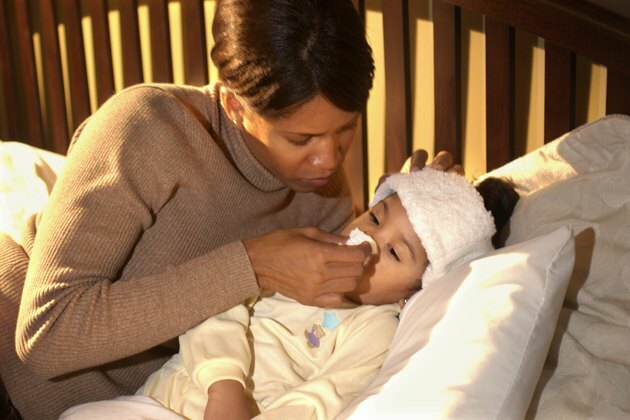 Your toddler may develop a low-grade fever, a congested cough or even vomit after a coughing fit. These symptoms do not necessarily indicate that her illness was caused by a bacterial infection, however. To prevent over-prescribing antibiotics when they aren't needed, pediatricians usually recommend waiting 10 days if the child is under 3 years old before the pediatrician evaluates him, the MedlinePlus online medical encyclopedia reports. If his symptoms do not go away by that time, he may have a bacterial infection. Over-the-counter cold and cough medications are not, as of 2011, recommended for toddlers or any child under age 6. Not only are they ineffective for treating the symptoms of young children, but they also can have dangerous and even fatal side effects. The best treatment is to keep your toddler hydrated, use a saline spray to clear out her nasal passages, use a cool-mist humidifier or a vaporizer and to set up the bed so your child is sleeping with her head elevated. Wait 10 days to consult a pediatrician unless your child is experiencing more severe symptoms. For example, if your toddler has a fever higher than 100 degrees Fahrenheit or is vomiting often, he may have more than a common cold. If his mucus or breath smell foul, consult his pediatrician. A rash, pain in the ear or chest or difficulty breathing also indicate that your toddler has a bacterial infection and he should be checked. Your pediatrician will determine the source of the problem and can prescribe antibiotics if your child has a bacterial infection.